U.S. President Donald Trump acknowledged nothing had budged the impasse over his demands for $5.6 billion US to fund a wall at the U.S.-Mexico border, tweeting: "Not much headway made today." White House officials and congressional aides emerged from talks aimed at ending a partial government shutdown without a breakthrough Saturday, though they planned to return to the table the following day. Both sides pointed fingers after the more than two-hour session led by Vice-President Mike Pence. Acting chief of staff Mick Mulvaney, in an interview on CNN, accused Democrats of being there to "stall." Democrats familiar with the meeting said the administration did not move on funding demands for a wall along the U.S.-Mexico border and would not entertain their request to re-open government while border security talks continue. The White House said funding was not discussed in-depth Saturday, but the administration was clear it needed funding for a wall. The official also said the meeting included a briefing on border security by Homeland Security Secretary Kirstjen Nielsen. Both sides said Democrats sought written details from the Department of Homeland Security on their budget needs, which the White House said it would provide. The two sides plan to meet again Sunday. 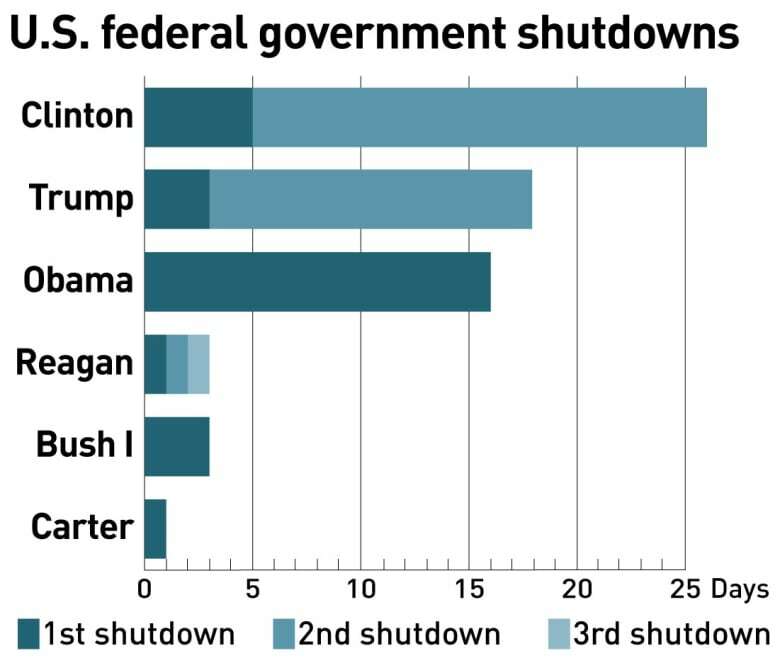 One Democrat, Maryland Sen. Chris Van Hollen, said in his party's weekly radio address that the shutdown "is part of a larger pattern of a president who puts his personal whims and his effort to score political points before the needs of the American people ... He is pointing fingers at everyone but himself." In calling on Trump to reopen government while negotiations on border security continue, Democrats have emphasized families unable to pay bills due to absent paycheques. But Trump has repeatedly said he will not budge without money for the wall. A variety of strategies are being floated inside and outside the White House. Among them is the idea of trading wall money for a deal on immigrants brought to the country as young people and now living there illegally. But Trump made clear during his news conference that talk on DACA, the Deferred Action for Childhood Arrivals program, would have to wait.